The vertebrae are held in place with muscles, ligaments, tendons and fascia. 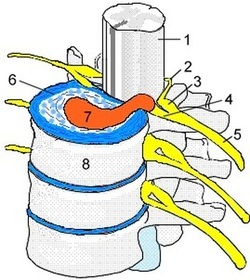 The Spinal Disc gives height to the nerve opening (foramen) . This is important to understand because the Spinal Nerves come off of the Spinal Cord, exit the spinal canal through the these foramen and continue on to the various glands, muscles, organs, and tissues that they regulate and control the functions of the body. The outer layer of the disc is called the Annulus Fibrosis and is made up of masses of ligaments. If you were to look at a Spinal Disc under a microscope, you would notice that the annular ligaments wrap around and around the center of the disc. This is because The Annulus job is to hold The Nucleus (the jelly-like center) in place. The Inner Nucleus (or Nucleus Pulposus) is the jelly-like centre of the disc which has the ability to push outwards in all directions. Bend to one side, and the disc tends to push toward the other. Bend forward, and the nuclear jelly pushestoward the back of the disc and so on.